The 38th Middlesex Rifle Volunteer Corps was formed on 25 May 1860 as part of the volunteer movement which arose after the Crimean War. 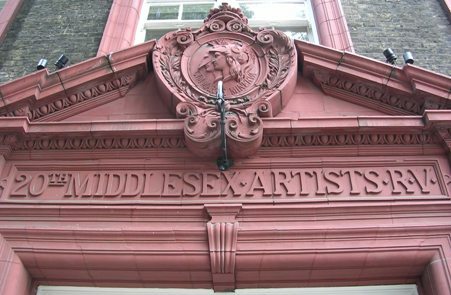 The 38th was composed of painters, sculptors, musicians, architects, actors and members of other artistic occupations and was based in the Chelsea area of Middlesex. For that reason it was almost certainly informally titled the "Artists' Volunteers". The badge of the 38th Middlesex Rifle Volunteer Corps was designed by W.C. Wyon, an original member of the unit and a Queen's Medallist and Engraver to the Signet. The helmet plate badge had a "Mars and Minerva" design in the centre and had the characteristic Maltese Cross background associated with the rifle regiments. 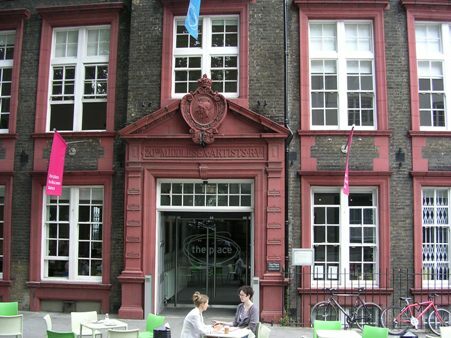 The Artists' Rifles adopted the 'Mars and Minerva' motif as their badge. The 38th Middlesex Rifle Volunteer Corps was renumbered the 20th Middlesex Rifle Volunteers in 1880. During WWI, the number of volunteers to join the Artists' Rifles was so great (in common with many other of the British Army's territorial units) that it split itself into two and eventually 3 lines: numbered the 1/28th, the 2/28th and the 3/28th London Regiment. The original 28th County of London Battalion (Artists' Rifles) mobilised on 4 Aug 1914 at Dukes Road, Euston Road and as 1/28th became part of London Division Army Troops in the St Albans area. In Oct 1914 it deployed to France , becoming an Officer Training Corps at Ballieul and in Apr 1915 at St Omer. In Jun 1917 the battalion was part of 190th Brigade, 63rd Division. It ended the war in the same formation at Marmignies, south of Mons , Belgium. The overflow of volunteers were mobilised as the 2/28th County of London Battalion (Artists' Rifles) in Aug 1914 and moved to Richmond Park. In Nov 1915, it moved to France and Flanders and was absorbed into the 1/28th Battalion then operating as an Officer Training Corps. The third line, the 3/28th County of London Battalion (Artists' Rifles), was formed in Sep 1914. In Nov 1915, it took the place of the 2/28th and was so renumbered. By Mar 1916 it was named No 15 Officer Training Battalion at Hare Hall, Romford. It remained there for the duration. During WWI, 10,256 officers were commissioned after training with the Artists' Rifles. They went to the Foot Guards, every infantry regiment and to many of the Corps. The Royal Artillery alone had 953 officers and the London Regiment 738 officers commissioned from the Artists' Rifles.